The Skinny: Good theatrical comedy can be translated into any language. However, it still needs to be well-directed, well-acted and well-produced. by Kozo: The classic play by Molière gets reimagined into a wacky costume comedy from Raymond Wong and Raymond To. The result proves that good situation comedy can overcome all cultural and language barriers. The result also proves that the source material isn't necessarily everything. 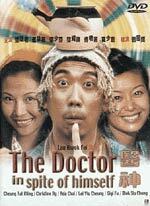 Cheung Tat-Ming plays the eponymous doctor, who's actually a woodcutter by trade. Thanks to various shenanigans, he gets mistaken for a doctor by some upper-class family who needs him to cure their daughter. He plays along, and manages to cures the daughter and generally solve the problems of everyone in striking distance. And he acts wacky.